Megan Oldham Golden In Silvaplana; She Clinches Slopestyle Crystal Globe! Megan Oldham continued her excellent first season on the FIS Freestyle Ski World Cup circuit on Saturday by winning the slopestyle event in Silvaplana, which allowed her to capture the Crystal Globe. Oldham, who was only in her fifth outing on the circuit, today achieved a third consecutive podium finish, this time winning the gold medal. 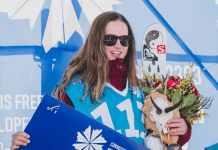 The 17-year-old from Parry Sound, Ontario, won bronze at Mammoth Mountain in March and silver at Seiser Alm, Italy in January. She today relied on a score of 84.51 in her first run to maintain her place on the podium. 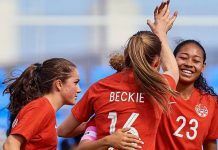 Oldham will be going to the FIS Junior World Championships in Sweden next week and will then be back home to do some spring training. The only Canadian woman competing at this last World Cup of the season, Oldham finished the event ahead of France’s Tess Ledeux (77.98) and Italy’s Silvia Bertagna (76.11). On the men’s side, Evan McEachran, who was back in competition after a few weeks on the sidelines due to an injury, finished in fifth place with a score of 86.90. His teammate and only other Canadian qualified for the finals, Teal Harle, finished in eighth place with a score of 84.58. The event was won by the Swiss Andri Raglietti (93.71), followed by the American Colby Stevenson (92.23) and the Swiss Fabian Boesch (91.25). Canada has captured the Nations Cup in slopestyle. This is the third Nations Cup for Freestyle Canada this season with those won in moguls and halfpipe. Canadians Étienne Geoffroy-Gagnon, Noah Morrison, Max Moffat, Mark Hendrickson, Noah Porter Maclennan and Philippe Langevin did not make it past the qualifying rounds.